There's something about Italian sliced meats, I really cannot describe my obsession, but anytime I see prosciutto on a menu, I need to order whatever entree ends up containing my salty friend. So obviously, I'm always looking for ways to incorporate these delicious meats into meals I can make at home. Normally, I end up pilling prosciutto slices nearly sky high on sandwiches (do you notice at restaurants how skimpy they are with it?? 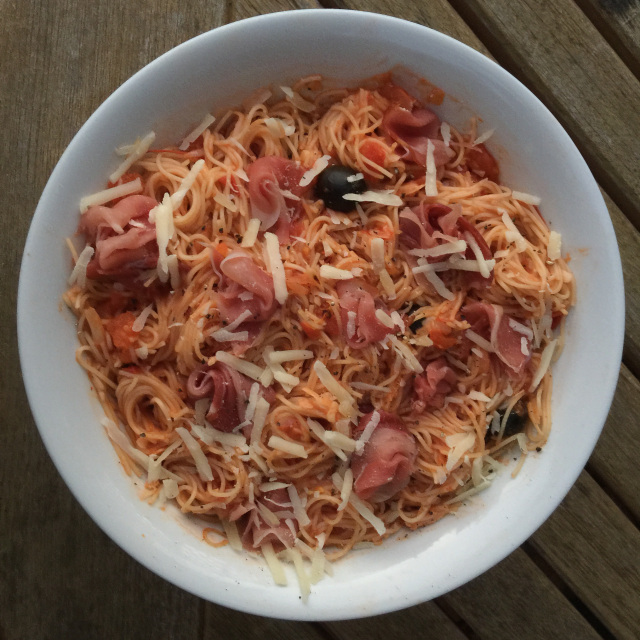 ), but when I saw this recipe pairing the protein with pasta, I knew I had to try it! 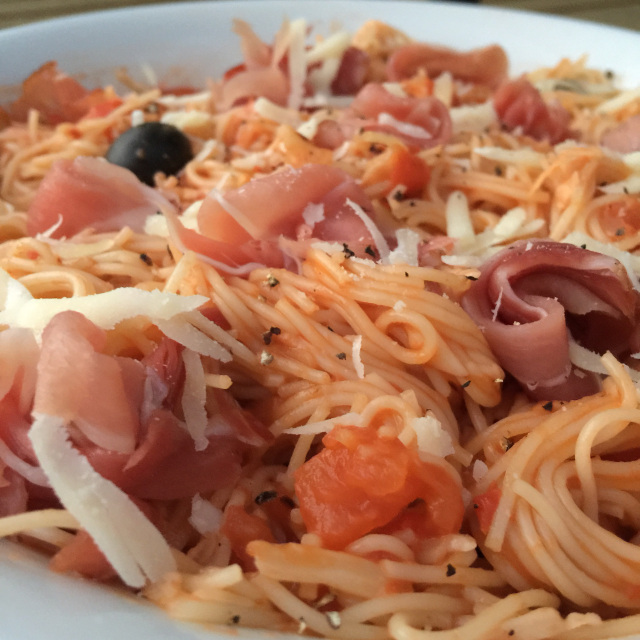 This recipe definitely brings the flavor- I am a big fan of Italian ingredients, so olives plus tomatoes plus my favorite protein made this a big winner. Bill on the other hand, refers to these as "Lauren" flavors, so he wasn't as convinced. But that's nothing a pile of prosciutto can't fix! In a large pot, bring water to a boil. When it boils, add salt and pasta. Cook according to package instructions, stirring often to loosen up the sticky strands. Drain the cooked pasta, but save about 1 cup of the pasta water. Set aside. Set the same pot over medium heat with and add the olive oil. When oil is hot, lower heat to medium-low and saute garlic and shallots until fragrant, about 1 minute. Increase heat to medium, add olives, and cook for 1 minute. Add the diced tomatoes and cook until soft, about 1 to 2 minutes. Next add the wine and stir until the alcohol has evaporated, about 2 to 3 minutes. Stir in tomato paste and butter until dissolved. Put the pasta back in the pot and gently mix until each strand is coated in the sauce. Add reserved pasta water if the sauce seems too dry. 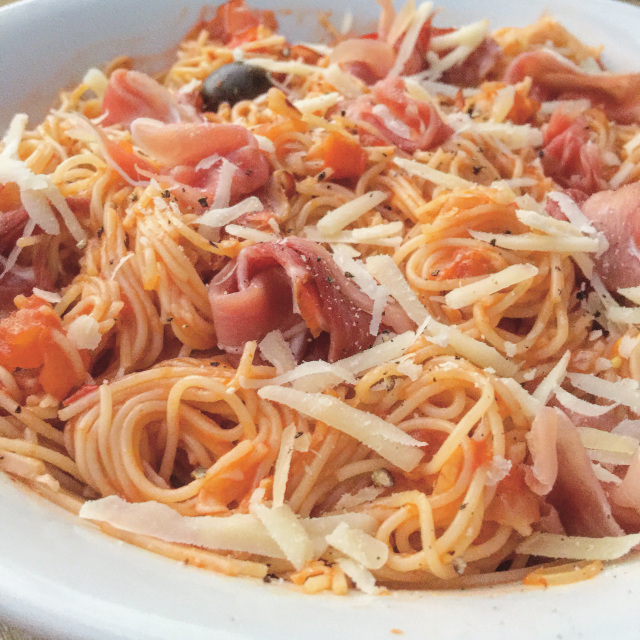 Toss with Parmesan cheese and garnish with prosciutto slices. Recipe from Tartine & Apron Strings.